Running a marathon isn’t for the faint-hearted, and seven Sweet Louise supporters took up the challenge in support of New Zealanders living with secondary breast cancer. The amazing team raised more than $11,000. 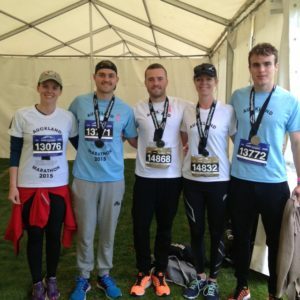 Brogan Donnelly took part in the ASB Auckland Marathon in memory of his dad and Sweet Louise Member Shane, who passed away in January 2015. Brogan alone raised more than $4,000! A huge thank you to all Sweet Louise runners and all those who sponsored them – because of you, we will be able to provide more than 20 Members with $500 in vouchers a year. These provide access to services such as lawn mowing, meals and house cleaning, helping to make life a bit easier.